Syphilis is an infectious condition caused by the spirochete Treponema palladium. 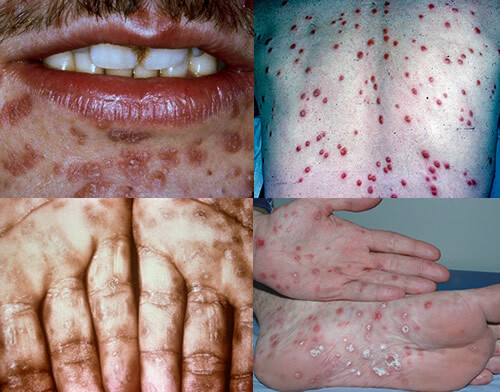 Primary syphilis: upon initial inoculation, the disease will be localized to single skin lesion. 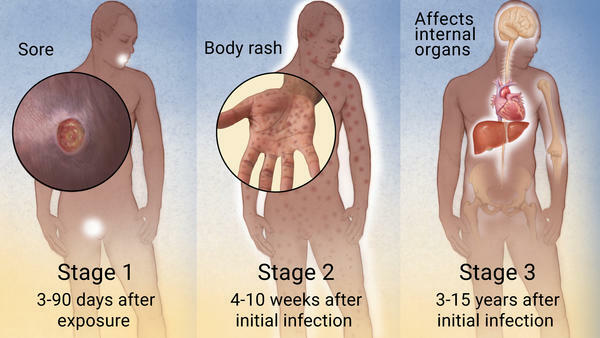 Secondary syphilis: at this point the disease has become disseminated (systemic) across the skin (large rash). Latent syphilis refers to progressed patient who is serologically positive for the disease but no longer has symptoms. Tertiary syphilis: once the disease has progressed even more, it will begin to involve internal organs. Congenital syphilis: syphilis of the newborn that has been transmitted by an infected mother. Neurosyphilis occurs when the disease spreads within the nervous system destroying structures and causing many different neurological symptoms. 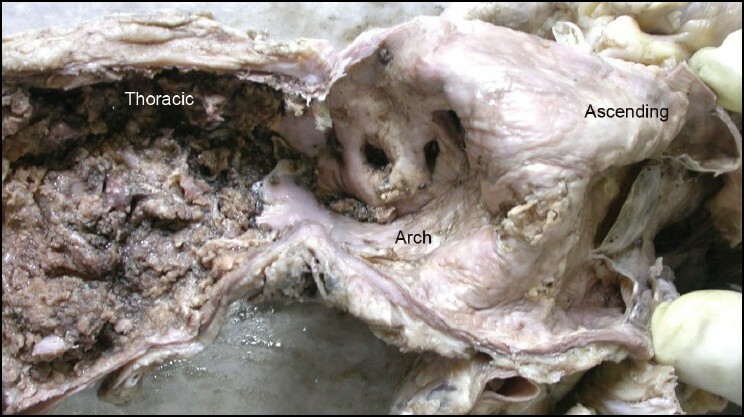 Syphilitic heart disease can be causes by the destruction of the vasa vasorum (vessels supplying the aorta) of the aorta with consequent atrophy of the vessel wall. This can lead to TAA and/or aortic insufficiency. Primary syphilis patients will present with a painless chancre (punched out base) and associated lymphadenopathy. Secondary syphilis patients will present with constitutional symptoms, a maculopapular rash (that does not spare the palms/soles), and condylomata late. Dark field microscopy can conducted on fluid from chancre/lesions/rash to visualize Treponema pallidum. This can also done on the CSF of an individual with neurosyphilis. FTA-ABS test ultimately will be the most specific for syphilis. Prognosis depends entirely on what stage the syphilis is diagnosed and treated. The longer the patient remains infected, the more irreversible damage may be caused by the pathogen. Congenital syphilis can be prevented if the mother is treated early in pregnancy (given that placental transmission occurs after the first trimester). Safe sexual practices can help prevent sexual transmission of this condition. Pregnant mothers who pass this on to newborns often will have a stillbirth, hydrous fettles, or a disfigured child. Jarisch-Herxheimer reaction: this presents as fever, chills, headache, myalgia following antibiotic for syphilis. Rapid lysis of the spirochetes result in endotoxin release. Lupus can lead to a false positive syphilis test (VDR) because patients possess anticardiolipin antibodies. Tree bark aorta will be seen in those damaged by syphilis (on gross exam). *Syphilis is a reportable disease that needs to be reported to the local authorities and the patient’s sexual partners.